Those who don’t, or can’t, buy tickets to see the Aug. 26 Floyd Mayweather Jr.-Conor McGregor bout in person at T-Mobile Arena in Las Vegas can purchase tickets to take in the closed-circuit feed at one of many venues around Sin City. Tickets for the Aria, Bellagio, MGM Grand, Mandalay Bay, The Mirage, Monte Carlo, New York-New York, Luxor and Excalibur are priced at $150 a piece, not including applicable fees. Tickets can be purchased online at www.ticketmaster, com or by calling 800-745-3000. Party packages are available at Aria, Bellagio and MGM Grand are available and can be purchased by calling 855-329-2260. Mayweather (49-0, 26 KOs) and McGregor – a UFC star – will tangle in a 12-round, junior middleweight boxing match. It will be distributed on Showtime pay-per-view for $89.99, $99.99 for high definition. We don’t get a lot of title-unification bouts these days, so when we do, we must relish the moment. From the sound of it, James DeGale of England and Badou Jack of Sweden plan on doing just that. They will square off Saturday at Barclays Center (on Showtime). Each fighter will put his super middleweight championship belt on the line. Jack (20-1-2, 12 KOs) can’t wait. Jack, 33, has been keeping his eye on his fellow champion, just in case this moment came to fruition. DeGale (23-1, 14 KOs) said he, too, has gone the extra mile in his preparation. 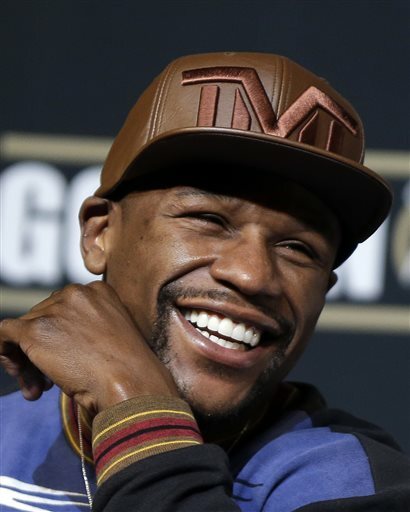 Floyd Mayweather Jr. and Marcos Maidana of Argentina on Thursday at 1 p.m. will play host to a news conference at Pershing Square, 532 S. Olive St., in Downtown Los Angeles and it will be open to the public. The two will be formally announcing their rematch slated for Sept. 13 at MGM Grand in Las Vegas. The Golden Boy Promotions/Mayweather Promotions event will be televised on Showtime pay-per-view. Mayweather (46-0, 26 KOs) and Maidana (35-4, 31 KOs) tangled May 3 at MGM Grand with Maidana giving Mayweather a tough go, Mayweather coming away with a 12-round majority decision. Aside from the interested parties, expected to be on hand for the proceedings are Jarret Stoll and Alec Martinez of the Stanley Cup-champion Kings. We should find out soon who Floyd Mayweather Jr.’s next opponent will be, but it was interesting to find out this week about the way he thinks as he is going through the process of making that choice. According to Richard Schaefer, a lot more goes into it than just selecting the fighter. “Floyd is the kind of fighter who fights anyone,” said Schaefer, CEO of Golden Boy Promotions, which helps Mayweather promote his fights. “He is obviously ultimately deciding who he’s going to fight. But at the same time, he is frankly more interested in the marketing and creating the entire atmosphere and positioning of his fight week and fight night to basically make this, as it has been the past few years, without any question the event to be at. Like the Super Bowl of boxing. Mayweather, 36, is 45-0 with 26 knockouts. In his most recent bout, he won a majority decision over Saul “Canelo” Alvarez on Sept. 14 at MGM Grand in Las Vegas. That was the fight where judge C.J. Ross scored the fight even, making hers one of the worst scorecards of the past 50 years, or since yours truly began watching boxing as a kid.